Founded in 1872, Domaine Sunnen-Hoffmann now extends over several vineyards covering an area of 9.3 ha, which enjoy the best exposure in the Remerschen region. The villages of the municipality of Schengen form part of a nature reserve called Haff Réimech. The lakes of Remerschen, the wideness of the valley and the location give this region a very fertile microclimate. The philosophy has stayed the same for five generations now: “Producing wines in harmony with nature, so that they always reflect the characteristics of the terroir and the varietal”. 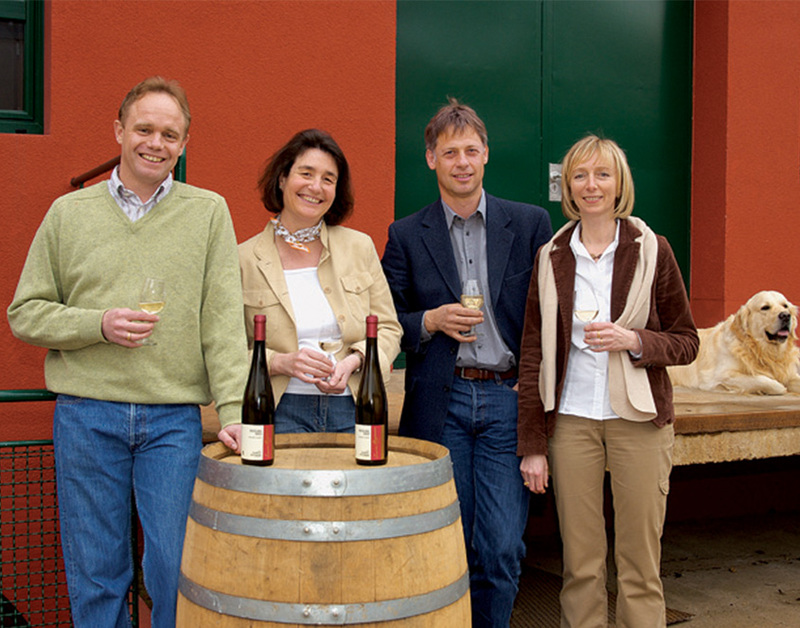 In 2001, Domaine Sunnen-Hoffmann became the first winery in the Luxembourgish Moselle Valley to grow its vines organically (Bio-Lëtzebuerg criteria). Since 2005, we have been a member of the Luxembourg Association of Open and Educational Farms (APFAPL) and, in 2009, we were made one of the model organic farms for the Grand Duchy of Luxembourg. Sunnen-Hoffmann is a founding member of Luxembourg’s first quality charter: Domaine et Tradition. Our five generations’ experience of cultivating vines and making wine mean that we can offer, along with the Luxembourgish wines that we produce, a large selection of renowned wines from other countries, such as France, Italy, Germany, Portugal and Lebanon. Please do not hesitate to contact us for further information or to organise tours of our winery, with tastings. Domaine Sunnen-Hoffmann extends over several vineyards covering an area of 8.5 ha, which enjoy the best exposure in the Remerschen region. Known as Haff Réimech, this nature reserve enjoys a fertile microclimate due to the proximity of the Remerschen lakes and the hours of sunshine offered by the wideness of the valley. Painstaking pruning of our vines and careful monitoring throughout the year, green harvesting and rigorous selection ensure that our grapes have an exceptionally aromatic quality. Our vineyards have been cultivated in line with organic farming principles since 2000 and they have been certified organic since 2001. Where our vineyards are planted depends on the exposure of the slopes, how steep they are and the structure of the soil. 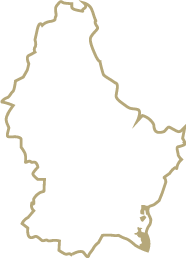 The varietals used are those typical of the Luxembourgish Moselle Valley: Elbling, Rivaner, Auxerrois, Pinot Blanc, Pinot Gris, Riesling, Gewürztraminer, Chardonnay and Pinot Noir. Organic viticulture in Luxembourg dates back to 1995, when the Hellef fier d’Natur foundation rehabilitated terraced vineyards located in Canach and started to cultivate them using organic farming methods. In 2000. we became the first winery in the Luxembourgish Moselle Valley to go down this route, with our first experiments limited to two plots of 0.35 ha. The results proved very promising and we now cultivate 9.3 ha, which follow the Bio-Lëtzebuerg and EU organic farming criteria, and are checked by Oekologischer Kontrollverein Karlsruhe. In November 2009, the Luxembourg Ministry of Agriculture, Viticulture and Rural Development granted us an honourable mention at the 2009 Bio-Agrar-Präis awards, in recognition of the remarkable commitment within Luxembourgish organic farming to the project of launching and promoting the organic viticulture business in the Grand Duchy of Luxembourg. No chemical fertilisers are used. Only the use of organic fertilisers and compost is permitted. No herbicide is allowed. A permanent and specially selected ground cover is planted between the vines, to serve as a green fertiliser and better structure the soil. We use natural products to treat against disease, not man-made chemicals. We also use leaf-removal to improve air circulation, which prevents the damp that would enable fungi to grow. The purpose of organic farming is to boost the vines’ disease resistance, while respecting the ecosystem. Since 2011, work at our vineyards has also followed some of the principles of biodynamic viticulture. Subtle, fresh and light wine. Sweet wine with a nose of Muscat. A seductive wine, thanks to its well-developed bouquet and slightly sweeter nature. Wine based on freshness and elegance. Slightly fruity wine, accompanied with a wonderful freshness and elegance. Full-bodied wine with a strong nose, it has a moderate, well-balanced acidity. Grown on the best plots, the “king of grapes” is characterised by its delicacy, its classy nature and its elegance. Fruity, generous and full-bodied wine with a bouquet of rose. A red whose silky tannins and delicate nose impress. Aromatic, balanced and complex wine. Interspecific varietal, a hybrid of Cabernet Sauvignon and an American varietal. Berry notes with silky tannins. Deep red colour. One of the purposes of organic viticulture is to enhance the expressiveness of the terroir and the varietal. Each plot is unique and developed individually. That is why our winery was completely refurbished from 2002 to 2005. The large vats were replaced with new stainless steel vats with 300- to 2,000-L tanks. This major investment means we can now produce wines from different plots using grapes harvested when very ripe. To add to this quality-focused approach, each plot is harvested in two or three stages and wine can be produced from each stage separately. In 2006, a cooling system for our vats was installed, which enables us to control the length of fermentation and use temperature regulation to preserve the flavours of the various varietals. In 2008, we modernised our bottling system, which offers great protection for flavours and quality during bottling. In 2011, a system was installed that uses gravity alone to unload the grapes into the press. This means we can avoid any pumping of grapes. In 2013, the Tasting Room for hosting small groups was completely renovated.